The FOL History Project began with a collection of documents such as newspaper clippings, worship folders, and other printed memorabilia found in a dusty box. These were placed in one 3-ring binder. In the last few months, more boxes of historic items have been located and the collection has grown to 13 binders as the picture shows. The first binder has been taken apart and the documents distributed among the new binders. CD’s and DVD’s have been included in the later years due to changes in technology. An appropriate storage location for these binders is being identified. The first group of documents are still on this web site and can be viewed below. The binder for the time span 1990 to 1999 has very few items. 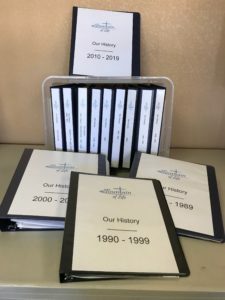 The current collection for that decade only contains the following: a photo of the interior of the sanctuary, snap shots of a visit to the Lutheran Braille Workers Home Office, a copy of a page from a 1997 FOL Directory with a brief history of the church, and a CD of an Organ Recital. Do you have items to add? Please consider sharing your stories and documents from the past with us so we can build on this history. Original documents shared with us will be copied and returned to the person submitting them. Stories can be emailed to estoeckel@folluthern.org or taken to the Church Office. For more information, contact Sharron Roemer or Elsie Stoeckel. Notebooks containing photo, newspaper clippings and other historical information.